Avinashi is a town in Tripur district located in the state of Tamil Nadu. Avinashi was earlier called Thirupukkoliyur. This place is located on national highway 47 and is one of the taluka of Tripur district. Avinashi is a suburb of Coimbatore. The name Avinashi itself suggest "indestructible". The temple is famous for the god Avinashi. It is a protected monument under the Archaeological survey of India. This place is famous for shiva temple which was built by Sundarapandiya. The most interesting thing about this temple is that Goddess Parvati is always on left side of Lord Shiva but in this temple she is on the right side. This place is renowned as destination for pilgrimage in Kongunadu region. Karivaradharaja Perumal, Anjaneya temple, Akasa Rayan temple, Angalamman temple and Ayyappan are some of the temples of Avinashi town. The population of town is about 337923 among which females are about 169868 and 168055 males. Child population contributes around 15424 male children and 14709 female child. Literacy rate is 68.05. To visit this place you need to go by air because there is no railway station connected. The nearest airport is Coimbatore international airport and distance between Avinashi town and airport is about 32 km. the nearest railway station is at Tripur covering distance of about 15 km. As per conveyance is concerned buses are the easiest mode of transportation provided by state govt. and private sector. There is a competition between state govt. and private sector for providing services to people. Powerlooms, timber works, textile, poultry, garments contribute towads business. Agriculture is the main occupation of people. Car festival is the most exciting festival in the city. 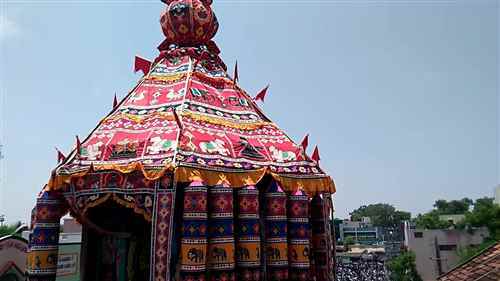 The car of temple is the second biggest car in South India. The car was remade because it was destroyed by fire in 90s. This is famous for fine wooden work and carvings. 63r festival is also a festival from this temple. This festival is also called Arubathi moovar ula. It is celebrated for 2 days but earlier this festival was celebrated for 10 days. The wheels of car is made up of iron, which needed peoples to move them but recently it was seen that car cannot be moved without using bulldozers. As the car is placed on road side there are increasing traffic jams so it was decided to move to a nearby temple place. Bhrammotsavam is celebrated annually in the month of Chittrai. Sri karunambika, chindhamani and Varanashi multiplex are the three known theatres of this place.